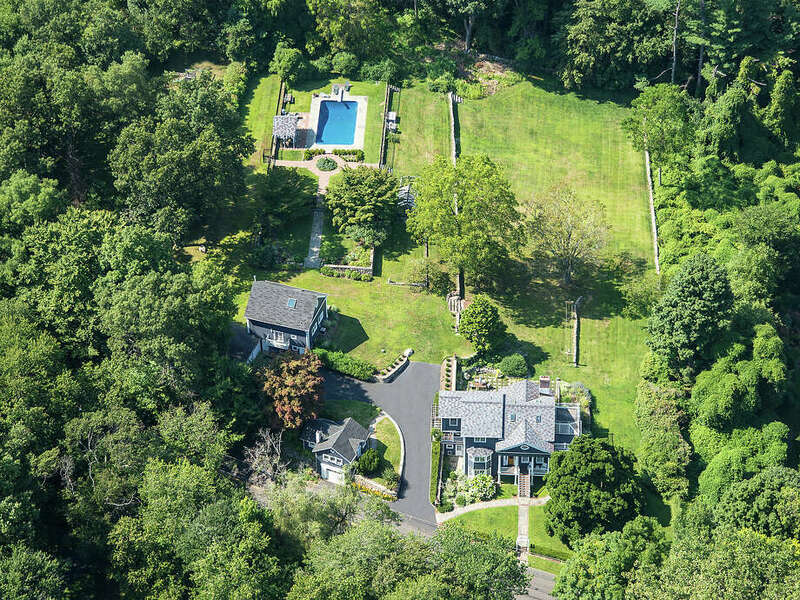 The property at 135 Comstock Hill Road is on the market for $1,999,000. Rich in both design and history, the historic Silvermine estate at 135 Comstock Hill has been an artist retreat for more than a century. Designed by master carpenter John Ryder, the home was built the home in 1845 after a Greek revival design his wife had admired. Later, the property was owned restored by William Boring, dean of architecture at Columbia University. Other notable owners include Hamilton Hamilton, a renowned landscape and portrait painter and founder of the Silvermine Arts Guild; Richardson Wright, founder and longtime editor of House and Garden, who gave the property its name "Sun House" and created the property's extensive gardens and stone walls; and Eileen Heckart, the Emmy, Oscar and Tony award-winning actress who lived in the house 40 years. Current owners have completely renovated the house since purchasing it nearly two decades ago, reconfiguring the interior while preserving the exterior. Recently, the property has been recognized twice by the Smithsonian Institute for its beautifully landscaped gardens. Inside, a large eat-in kitchen outfitted in bead board and creamy sage green cabinetry and counters features French doors leading to a romantic sunken terrace woven with timeworn stone walls. The lovely stone patio is blanketed with a spring-blooming thyme, boasting shades of vibrant pink in the spring months. A formal living room features an angled gas fireplace, French doors to the patio and an exposed wooden beam. The living room opens into a sun-drenched solarium with three sides of windows and a beautiful Palladian-style window and skylight. Uniquely, the dining room is on the lower level of the house, where it was in the 1800s. Interior brick walls with an original fireplace create a cozy dining space soaked in rustic charm. A multifunctional space off the dining room is used by current owners as a family room, but could be used as an additional bedroom with a full bath. The lower level also hosts a large laundry room and a private office that was formerly an open porch prior to renovations. The bright and airy space is wrapped in two walls of windows, perfectly framing the property's white Magnolia tree, one of the oldest trees in Connecticut said to take your breath away when it is in full bloom. The second floor of the home features two charming guest bedrooms with architecturally vaulted ceilings, skylights and original wide plank hardwood floors. A third guest room features a loft bed, perfect to use as a child's bedroom. The fully carpeted master suite features a tray ceiling, large walk-in closet and Juliet balcony overlooking the nearly two acres of English-styled gardens. The master bath features his and hers pedestal sinks, a step-in steam shower with earthy slate tiles and a sunken soaking tub. The property includes a heated greenhouse, heated pool, gazebo and two guest houses. The rear guest house has a great room and second floor bedroom and sitting area. With a North-facing window, the space is ideal for an artist or writer's studio. The front guest house is currently used as a second office, but could easily function as a guesthouse, in-law apartment or studio. For more information or to view the property, contact Susan Blabey of William Pitt Sotheby's International Realty at 203-979-7774 or sblabey@wpsir.com.